Can You Hear Me Now? is hosting our first HAPPY HOUR call in AND YES!!! we want to hear from you this Friday NIGHT! What makes you a survivor and not a victim? Celebrate by sharing that success with listener! Call in number is 347-215-7754 6PM to 7PM Pacific Time Friday! Author/Advocate/Speaker/Survivor That’s me, Annie O’Sullivan and my wonderful co-host Kelly Behr who is Head Goddess at Mountain Goddess Unplugged will bring you honest upbeat conversations about the dark subject of child abuse and child sexual abuse and how to not only survive, but thrive. Please tune in on Friday evenings at 6pm PST, 8pm CST, 9pm EST for a line up of great guests and no holds barred discussions. 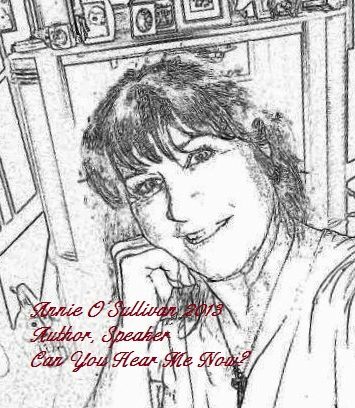 My Book, ‘Can You Hear Me Now?’ is available on amazon & Barnes and Noble as well as other online stores.